EATON — For the fifth year in a row, Preble County Art Association is presenting Oinkers for Art, and the Oinkers auction will take place at 7 p.m. on Friday, Sept. 28, as part of Arts Night Out. Attendees can bid on any of the 10 pigs which were painted this year by The Star Theatre at Eagles Point, Sarah Shepherd in Memory of Michael Wallace, Heidi Flory, Samantha Gramaglia & Mandi Mullins, Preble County Juvenile & Probate Court, The Greenbriar/Viktorya Howard, Somerville Bank, Henny Penny, Roselius Insurance, and Reid Family Care. Every entry has a chance to take home a Golden Oinker. One Golden Oinker Award is given for each category including: Oinker of the Year, Overall Best Pig; Norman Porkwell, Hometown Pride; Pablo Pigcasso, Originality; Andy Warhog, Essence of Subject; and Porker’s Choice Community Favorite. 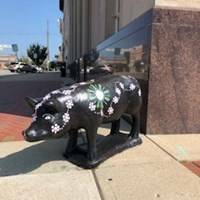 The pigs can be seen on display in downtown Eaton until Sept. 25. Anyone can vote for their favorite at https://www.preblearts.org/oinkersfor-art. Kent Stonecash will serve as auctioneer, getting the Oinkers for Art Auction started at 7 p.m. The public is invited to come out and join in on the fun of bidding on the 10 unique oinkers. Art’s Night Out is an interactive experience designed to combine entertainment and education of the arts. This event will feature live music by Tommy Renfro, food by Adam’s Rib food truck, craft beer by Toxic Brewery, art demos and sales, art activities, and more. The program is generously supported by LCNB. Visit www.preblearts.org for the latest specials and workshops or call 937-456-3999. The Visual Art Center is located at 601 Hillcrest Dr. in Eaton. Fall hours are Tuesday-Friday 1-6 p.m. and Saturday 10 a.m.-2 p.m. The Preble County Art Association is a nonprofit organization dedicated to making art accessible to Preble County.